Who’s gonna let a little inclement weather keep us from having fun with dogs this weekend? Chasco Fiesta Pet Adoption Fair tomorrow/Saturday, Orange Lake in New Port Richey. 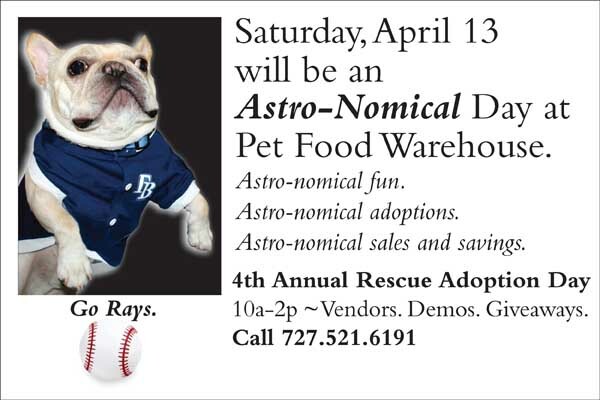 The 4th Annual Rescue Adoption day is also on Saturday at Pet Food Warehouse, starting at 11a and going on until 3p. Our first Bark in the Ballpark of the season takes place in Dunedin with the Dunedin Blue Jays. What’s doggin’ in your part of Florida this weekend? Previous Previous post: Jacqueline Sheehan’s Book, Picture This, A Favorite Read of The New Barker. Next Next post: Gather Round And Share The Love.